NOTE: I was enjoying a cold drink at Starbucks with my son today in Cebu City, Philippines and as I was browsing the The Philippine Star I notice this article. My son suggested that I ask one of the salespeople if I could clip the article out of the paper since it was late in the day. The young clerk agreed to clip the article and give it to me. I thanked him and told him I was from Canada and that my blog had lots of information about my experiences here in the Philippines.I then gave him my business card with the address of my blog and he also gave me his email address. It was wonderful how open and friendly the Filipino people are!! The article is now posted here on my blog - see below! The article conveys the positive things about being poor and highlights their simplicity, patience and contentment with their plight BUT no solution. This article titled: 'Any Filipino Town (Community) Can Launch A UsuryFree Time Currency' does offer a solution that can help eliminate poverty. 'Who is poor? Government has a way of defining it in peso value, of those being under the poverty line. Perhaps, you my readers, would identify the poor as those living in the streets, the beggars and those living in shanties, a.k.a. urban poor. They are poor, but in my humble opinion, the poorest of the poor are those living in the outskirts, which I am truly in awe of. First of all, let me clarify that I do not want to be poor because it is difficult to stricken off the right to choose or that fighting chance to life. My heart goes out to them. And yet surprisingly and quite often, I come out learning from the poor and drawing so much from them, much more than what we give them. Picture this. You visit a poor man’s home. He welcomes you, asking for “pasensya” because he has a small house. You enter his house made from nipa hut with its bamboo floors making a cracking sound everytime you make a step. You think twice if the house can support your weight. Notice that the people inside have taken off their slippers, taking extra care to keep their home neat. Everything’s there in that house the size of two cars — their living area and their sleeping area. You don’t see the beds because they don’t have any. Having an old foam to sleep on is already a luxury. You wonder where they put their clothes. And on the corner you notice a sack or plastic bag, and realize that it is everything they have. They do not have furniture, but a small bangko by the door, outside the house. And on the wall is a calendar with a photo of the mayor’s family. h glasses on a plate. They serve you crackers and softdrinks that are not chilled because the sari-sari store next door does not have a refrigerator. Apparently, the neighbors have pitched in for the merienda. Again, they ask for “pasensya” for what they could only afford to prepare. When you need to use the toilet, they direct you outside the house, just a few meters away, and you find a rusting galvanized yero — the door. The toilet is a hole on the ground, and you step on the wood surrounding the hole for balance while you do your thing. This is only a glimpse of the poor’s generosity and how openly they welcome a stranger to their home; so trusting and with hardly any suspicion towards their neighbor; and always willing to lend a hand and share whatever they have on the table. 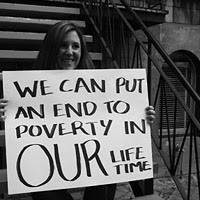 Maybe it is this poverty that has sanitized them from the ills of society. I don’t know. But truly their lives are so simple and uncomplicated. They live by the day, waking up early to farm while the sun is up and finishing before nighttime, like clockwork. Rarely do they ask for anything. Life is so simple. And even during calamities, the poorest of the poor evacuees get what is enough, even falling in line for relief, ever so grateful and even offering a smile despite losing their loved ones and all that they have. “Diyos na ang bahala sa inyo” are their words. What faith in God they possess! And how they surrender with their faith when something unfortunate happens. “God has a plan,” and with hardly any hang-ups, they move on with their lives, less of the drama material of blaming whoever it is to blame for the misfortune and their illness. They accept that they are not in control of events brought about by their own limitations, but honestly, who is? Aren’t they more blessed because they know the meaning of surrendering to God’s will? Am I saying that we should be poor and give away all our money? No. But it is really a challenge for us with all our choices and resources to focus on what is truly important. And we look at the poor to live richer lives. Multiple millions ( More than 10 million) of Filipinos are working outside the Philippines and sending money back home to their poor families. Incredible!